This month’s Daring Bakers’ Challenge took us on a trip to beautiful Brazil! Renata ofÂ “Testado, Provado & Aprovado!”Â taught us how to make Pao De Queijo, tasty cheese buns that make the perfect snack or treat, and that will make your taste buds samba! When we were going through the elimination testing for the Low-FODMAP thing, I had come across these Brazilian cheese rolls made with tapioca starch and Parmesan cheese but were otherwise made just like pate a choux.Â Fast forward almost 18 months and I had a dream about these rolls, specifically about not being able to find the recipe even though I was looking in the book it came from. Two days later I checked the Daring Bakers board and found that this month’s challenge was the exact same Pao de Queijo I’d been dreaming about. But in the tastiest way possible! Our hostess, Renata, gave us a couple of variations on the Pao de Queijo I had made before, one of which involved making not puffs but waffles with the mixture. Her versions also tended to use cheeses that weren’t so dry, and I had a block of apple-smoked Cheddar in the fridge just waiting for a good use. This was so incredibly good. I do need to work on my egg poaching–I’m a bit out of practice–but otherwise it went off without a hitch. In fact, we stopped by the outlet mall on our way back home from the most recent convention and I was very tempted to pick up some Poach Pods Â (affiliate link)Â from the kitchen store. But where’s the challenge in that? Wonder what next month’s challenge will be, and if it will be another recipe of my dreams! You were so creative with pÃ£o de queijo! 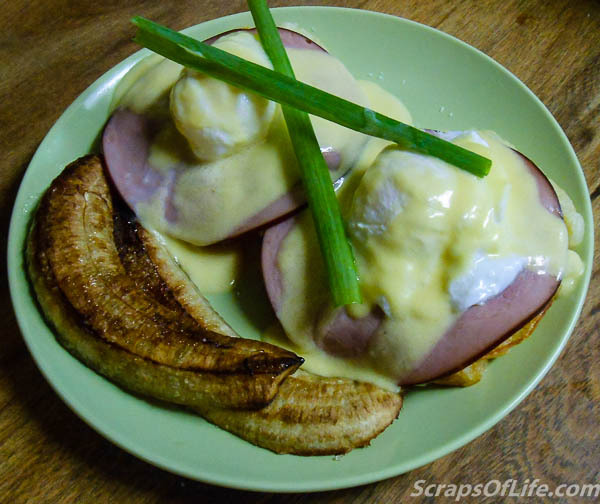 I love your eggs Benedict with broiled bananas… now that looks yummy! And about your dreams… wow! that was amazing! Thanks so much for jining the fun! 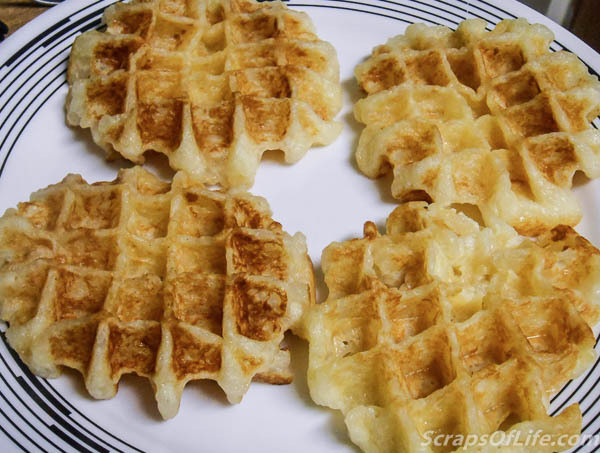 It’s a good thing that pao de queijo are so quick to make, I see these waffles showing up again and again in our kitchen. Thanks for the inspiration!